David Beckham became the first England player to score at three World Cups as his free-kick earned a quarter-final tie against Portugal on Saturday. Beckham defied illness to curl home from 30 yards on the hour mark, but England made hard work of Ecuador. The South Americans could have gone in front early on, Carlos Tenorio's shot deflecting off Ashley Cole and on to the bar after John Terry's mistake. Frank Lampard missed two fine chances but England had done enough to win. Sven-Goran Eriksson's side will now play Portugal - after their stormy 1-0 win against Holland - on Saturday 1 July at 1600 BST in Gelsenkirchen. Again Eriksson will point to a job done, but again it was an England display which will produce more questions than answers. They had to rely on a trademark free-kick from Beckham, who was later sick on the pitch after suffering from dehydration and heat exhaustion. Playing a 4-1-4-1 formation with Wayne Rooney up front alone, England looked comfortable and clumsy in equal measure on a strange afternoon in Stuttgart. Yet they started off by doing the sensible thing in the stifling heat, with Michael Carrick at the hub as they passed the ball around and made Ecuador do the running. However, the first genuine chance fell to the South Americans and after an error by John Terry they came agonisingly close to taking the lead. Terry completely mis-timed a headed clearance and the ball fell to Carlos Tenorio to run clean through, the striker's fierce shot crashing off the bar thanks to a fine sliding block from Ashley Cole. It was a Jekyll and Hyde performance from England - one minute keeping the ball with ease, the next giving it away and inviting pressure on to them. Rooney cut an isolated figure as England put more effort into not conceding than scoring but they still looked shaky at the back, as Rio Ferdinand nearly put through his own net and Terry was booked for a neck-high tackle on Carlos Tenorio. The decision to play Carrick in the holding role gave England a better base to build from, but Lampard and Gerrard were not getting forward enough to give the increasingly frustrated Rooney some much-needed support. The 20-year-old could only look on with envy at the other end as Carlos Tenorio and Agustin Delgado hunted as a pair, causing Terry and Ferdinand to lose their usual composure. Gerrard took it upon himself to improve things after the break as he bombed forward from the left, only to see his centre run across the six-yard line with no England player in sight. When the breakthrough came, it was like travelling back in time to 2001 when Beckham was at the very peak of his powers. He sized up the opportunity from 30 yards, wonderfully whipped the ball over the wall and towards the bottom corner and saw it creep past Cristian Mora at his near post. Lampard twice had chances straight after to double the lead, first dragging a left-foot shot wide then failing to find Rooney in the box when he should have shot himself. He missed a sitter with 17 minutes left too, blazing over from 14 yards after some sensational skill from Rooney by the left touchline. Fortunately, it made no difference. England, for the second time under Eriksson, have reached the last eight of the World Cup finals. England: Robinson, Hargreaves, Terry, Ferdinand, Ashley Cole, Beckham (Lennon 87), Carrick, Gerrard (Downing 90), Lampard, Joe Cole (Carragher 77), Rooney. Subs Not Used: James, Campbell, Bridge, Carson, Crouch, Jenas, Neville, Walcott. Ecuador: Mora, De la Cruz, Hurtado, Espinoza, Reasco, Valencia, Edwin Tenorio (Lara 69), Castillo, Mendez, Delgado, Carlos Tenorio (Kaviedes 71). Subs Not Used: Villafuerte, Ambrossi, Ayovi, Benitez, Borja, Guagua, Lanza, Perlaza, Saritama, Urrutia. Booked: Valencia, Carlos Tenorio, De la Cruz. David Beckham's goal was his second from a free kick at the World Cup. Only four other players have achieved that feat before: Pele and Roberto Rivelino (both Brazil), Teofilo Cubillas (Peru and Bernard Genghini (France). Beckham is the first ever English player to have scored at three different World Cups, in 1998, 2002 and 2006 (one goal at each). 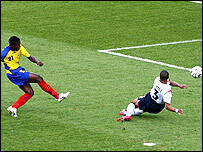 Beckham's free kick was the 63rd in the history of the World Cup and the sixth in 2006. Only three World Cups have seen more goals from free kicks than in 2006. The record is nine set four years ago. Ashley Cole earned won his 50th cap. All his international matches have come under Eriksson's reign. Argentina are the only team ever to have scored against England at this stage. In other second round matches, England beat Paraguay 3-0 in 1986, Belgium 1-0 in 1990, Denmark 3-0 in 2002 and now Ecuador 1-0.